Cyber Monday has come and gone, now it's all about, erm, Wealthy Wednesday? Ok, nobody actually calls it that, but we still have a bunch of games-related savings for you. Today's selection of gaming deals includes some rather nice PS4 and Xbox One bundles as well as a bunch of games and hardware discounts. Today's deal of the day is a sizable saving on an Xbox One S 500GB Battlefield 1 bundle, all for just $269. View Deal: Xbox One S with Battlefield 1 for $269 from Walmart. Check out the best US game deals below, and make sure to check in tomorrow for more PS4, Xbox One and hardware savings. Xbox One S 500GB: Xbox One S with Battlefield 1 for $269 from Walmart. This deal will save you $30 on an already nice bargain, packing in a new Xbox One S and a copy of Battlefield 1. It's a great introduction to the current generation if you're not already here yet, or a tempting way to upgrade to the latest Xbox console. PS4 500GB: Pick up the slimmed-down new PS4 model and a copy of Uncharted 4 for $289.00 at Amazon. PS4 1TB FF15 Limited Edition: This bundle comes with Final Fantasy 15 Deluxe Edition, but you'll be so mesmerized by the moon graphic on the top of the console it might take you a bit to start playing. It's $449.99 at GameStop. Xbox One S 500GB: Head back to WW1 with a new Xbox One S for $269 at Walmart. Xbox One S 500GB: Play Minecraft online with this bundle that includes a 3-month Xbox Live Gold subscription, available for $314.99 at GameStop. Xbox One 500GB: Start your collection with this Gears of War: Ultimate Edition and Forza 6 bundle, now $249.99 at GameStop. Assassin's Creed: Syndicate (PS4): Get a killer deal on historical assassinations, now $13.88 at Amazon. FIFA 17 (PS4): Play everything from exhibitions to an RPG-inspired cinematic career mode for $39.99 at Amazon. No Man's Sky (PS4): Try the new foundation update with this discounted deal of $33.50 at Amazon. 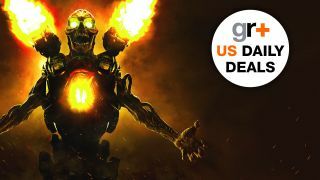 Doom (Xbox One): Save on the most gut-ripping shooter of the year when you buy Doom for $27.90 at Amazon. Rainbow Six Siege (Xbox One): High-speed tactical combat comes blasting through your living room wall for $19 on Amazon. Super Mario 3D World (Wii U): Feast on platforming greatness in up to 4-player co-op for just $14.19 at Amazon. Donkey Kong Country: Tropical Freeze (Wii U): So many barrels, so few dollars, all just $14.36 at Amazon. Monster Hunter: Generations (3DS): Kill giant monsters with your cat friends for $15 off, now $24.99 at Amazon. LG 4K HDR TV: The OLED55B6P from LG has a beautifully vibrant 55" OLED screen, and you can pick one up for $1,997 at Amazon. VIZIO 4K HDR TV: Or you can save and get some extra screen space with this 65" Vizio model for $899 at Target. Bose Home Theater System: Save $250 on great sound in a modestly sized package, now $849 at Abt. Klipsch 5.0 Home Theater System: Go for a full 5.0 setup with these speakers, just add subwoofer. Now $249.99 at Newegg. Sony H.ear Wireless Noise Cancelling Headphones: Take $150 off on these wireless/wired cans, selling for $199.99 at Amazon. Sony 4K Blu-ray Player: No game console? No problem, this nice 4K Blu-ray player is only $178 at Abt.